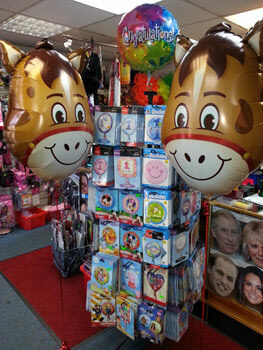 Partymania have a huge selection of balloons for every occasion. You can't have a party without balloons - the more, the better! Balloons in all shapes, sizes and colours, suitable for birthdays, engagements, weddings, hen nights, graduations, anniversaries, baby shower, new baby, valentines, retirement, corporate functions, etc. We helium fill balloons while you wait. We can create professional balloon table and floor centres tailored for your every occasion.